It is official - Sam has finally been to the Emergency Room. Sam fell off the monkey bars in the big kid's playground at school yesterday - his 4th day of 1st grade. Sam has a buckle fracture of the left wrist. He took today off from school to adjust and tomorrow we are going to the orthopedic specialist for casting. 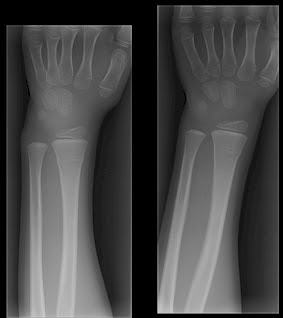 If you look closely at the x-rays, you will see a line and bump in the right arm bone about a screen centimeter below the wrist joint. Sam was pretty oblivious to the pain - if any. In the hospital he flirted with the nurse and x-ray technician. Last night it throbbed a little. Mostly he's fine, but for the inconvenience of a cast (4 weeks) and the lost monkey bar time.